The Gutter Shield System is very effective at keeping leaves and debris out of your gutters. Tired Of Cleaning Your Gutters or Hiring It Out? We sell and install the best gutter leaf protection systems. Leaves and debris falling into your gutter can spell disaster for your home if it’s ignored and never taken care of. Not only that, have you ever tried to walk through the front entrance of a home that had a clogged up gutter system during some heavy rainfall? It’s just like taking a cold shower. Thankfully there are gutter leaf protection systems designed to keep your gutters clear of leaves and debris. L.I.K. Seamless Gutter Co. is a full service gutter installation company based out of both Suffern and Monroe, NY. 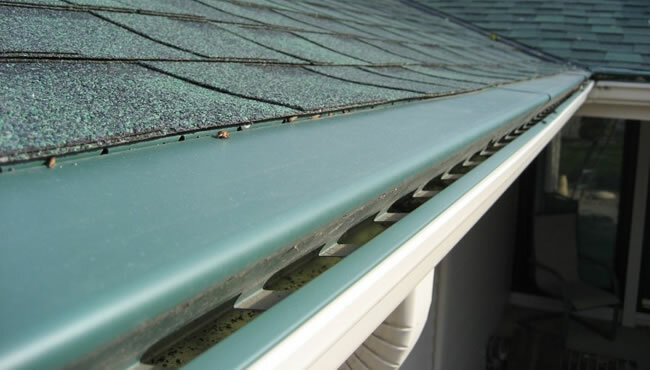 We specialize in all aspects of gutter systems including leaf protection systems. Every home owner’s leaf situation is different. L.I.K. is pleased to offer options to suit every home’s needs when it comes to leaf protection. A home with minor leaf problems yet still enough to clog a gutter causing potential flooding requires a different product than the home surrounded by many close cropped tall trees shedding leaves at a pace that requires cleaning multiple times a season. Covering your gutters is very site specific and prices can vary according to the product and layout of your roofline. Contact us for an evaluation to recommend which system best suits your home and business. Aluminum Drop-in Gutter Protection Screen. This is the most affordable option when it comes to gutter protection. 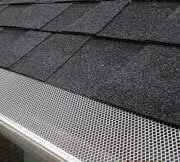 The Gutter screen is installed underneath first row of shingles and is fastened with screws to the top lip of the gutter. While gutter screens are very effective at keeping debris out of your gutter they can still collect shingle granules and will also need to be cleared of leaves, sticks and other debris a few times per year. If you don’t keep them clear they will can clog. Keeping them clear is as simple as running a stiff brush along them once or twice per year or if you see any build-up. 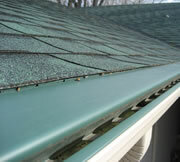 The Gutter Shield is a solid cover that we install onto your gutters. The specific design only allows the rain water to enter the gutter through a small horizontal opening on the front edge. Water hugs the nose of the gutter and flows into the appropriate channel through a process called “surface adhesion” while the leaves and debris are simply swept over the edge and fall to the ground. Even though it’s a much more effective solution it’s still something you’d want to inspect once or twice per year. We offer two great solutions for people who are sick and tired of cleaning out their gutters. If we are replacing your gutters then we can install leaf protection at the same time or separately if you already have proper gutters installed. Why Choose L.I.K. Seamless Gutter Co To Install Your Gutter Leaf Protection? When you choose L.I.K. 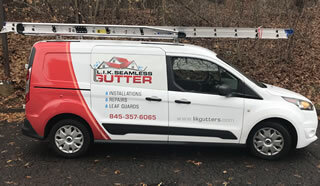 Seamless Gutter Co. to install the gutter leaf protection on your home you are partnering with a local family run business that has being successfully operating for over 40 years. Now being run by the 2nd generation, the Vasilik brothers are true craftsman who put great thought and care into every single gutter protection we install for our customers. You can count on receiving a quality product, installed by a small and dedicated team of craftsman who will leave nothing behind but what we’ve promised you. Your gutter leaf protection system will carry a warranty and you’ll have the peace of mind knowing that we’re going to be around to service it should you ever need us again. If you’d like to request an estimate to have gutter lead protection installed on your home please give us a call or fill out our contact form and someone will be getting right back to you. "Removed old gutters.Installed gutters around the whole house". Installed screens on gutters. Put three coats of paint on a trim piece that was needed for my fascia board to ensure a straight gutter. Cut neatly through deck for downspout. Got a perfect color match to my house trim. Neat, fast, very responsive to my questions and to follow up questions. Provided extended downspouts where needed without extra cost. Very nice and responsible! I dealt with Dareen, an owner, who made sure the job was complete and done right. Professional in every way. Excellent! Done in a day. Very neat and very professional. Highly recommend them to anyone! It is a family business and you can tell by the way they respond to your needs and questions that they are there to please their customer. "They responded promptly and courteously to our request for an estimate and were on time on the day of installation." The work went smoothly and professionally, They even re-pitched the gutters to better handle the rain volume as the old gutters where installed to drain all in one direction. All old gutters were removed and no trash was left around. Where needed they cut back some shrubs and left the small amount of branches neatly piled by the side of the driveway for us to dispose of. In all We would highly recommend them to all.